2017 could become the year when far-right and nationalist parties show good results during a series of elections scheduled in a number of EU member states. MOSCOW (Sputnik) — Amid growing anti-migrants sentiments and general discontent with the European Union, Europe is likely to witness major gains for far-right and nationalist parties during a series of elections scheduled in a number of EU member states in 2017. In the Netherlands, where parliamentary elections will be held in March 2017, Geert Wilders who built his Party for Freedom 10 years ago on anti-immigration and euroskepticism platform has now emerged as one of the most popular politicians. Wilders vows to confiscate Korans, close Islamic schools and ban migrants from Islamic countries and says his goal is to "speak truths other parties don’t dare speak, for fear of being called racist or receiving threats." According to the December poll by the Maurice de Hond Institute, the Party for Freedom with Wilders at its helm is projected to get the largest share of seats in parliament — 36 out of 150 seats, thus tripling its representation in parliament and pushing to the second place the ruling People's Party for Freedom and Democracy led by Prime Minister Mark Rutte (with 23 seats against 40 they have today). More dramatic losses are projected for The Labour Party, with the poll giving it just ten seats against the current 35. The country is usually governed by a coalition of two or more parties since no party ever wins a majority by itself, but all other political factions in advance ruled out any coalition with the far-right. However, the rise of Wilders and his party is a reality that cannot be easily ignored ahead of the upcoming elections. "I’m telling you, the genie will not go back into the bottle," Wilders said in one of his recent interviews. Wilders has been living under constant police security surveillance because of death threats he is receiving for his anti-Islam remarks. In early December, he was found guilty of discrimination against Moroccans after asking supporters during a 2014 election rally whether they wanted fewer Moroccans to move into their country. The court though imposed no fine or sentence. Despite the trial and the verdict announced just three months ahead of the general elections, Wilders’ party is only gaining popularity and is leading in polls. The Party for Freedom is also capitalizing on its calls for a Dutch referendum on leaving the European Union. When in April Dutch voters rejected in a non-binding referendum the EU-Ukraine association agreement, Wilders told Sputnik that this decision may help the Netherlands "to liberate ourselves from the Brussels monster". No wonder, the Party for Freedom leader was one of the first politicians to express his joy when the United Kingdom voted to leave the European Union in a landmark referendum on June 23. Even though Prime Minister Rutte admitted last week that passing the EU-Ukraine deal following its rejection by voters would hardly score the party additional points on the eve of elections, he and other EU leaders agreed on an updated version of the agreement, which will be debated in the Dutch parliament next month. Meanwhile, for Wilders, as well as for other parties, it is a good chance to make use of voters’ dissatisfaction not only with the EU itself, but also with Rutte’s actions that are widely presented now as a betrayal of his own voters. While the Netherlands is bracing for parliamentary elections, France will elect its new president in 2017. 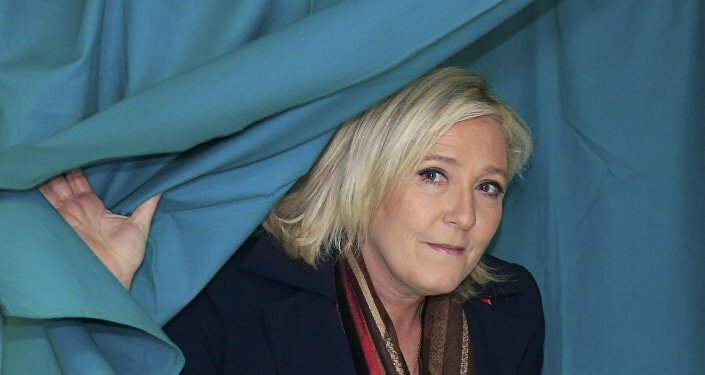 The National Front (FN) which is riding high in the polls in France adheres to the same "mantra" as other populist far-right parties all across Europe: No to migrants, No to Islamization and No to Brussels’ grip on the national affairs. Since its establishment in 1972, the FN has been constantly pushing for more barriers to the arrival of migrants in France. 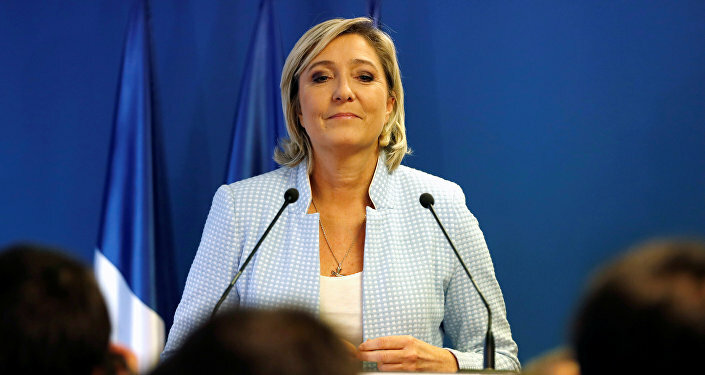 Its current leader Marine Le Pen, who most polls believe to be able to move to the second round of presidential elections scheduled for May, says she would limit the number of migrants allowed legal entry onto French territory to 10,000 per year. In 2016, France registered 80,075 asylum applications, according to the latest report of the French Office for the Protection of Refugees and Stateless Persons. The FN believes that curbing the number of arrivals would alleviate the burden carried by the French taxpayer. Bernard Monot, who is responsible for the FN’s economic policy, calculated in early December that France could save about 8 billion euros a year if it narrowed family reunification, asylum and labor migration programs. In France, where economic growth reached just 1 percent last year and youth unemployment was at about 25 percent, promises of benefits from reducing migration play well into voters’ hopes. If elected, Le Pen would also raise the question of holding a referendum on Frexit and a vote on possible abandonment of the European single currency. "Brexit has really broken a taboo," Le Pen famously said in September to the president of the European Commission Jean-Claude Juncker, adding that the United Kingdom had shown Europe that leaving the bloc and coming out on top was possible. Like Wilders in the Netherlands and many other far-right politicians and groups all across Europe, Le Pen clearly counts on the "Trump effect" to raise her own chances of entering the Elysee Palace upon the May 2017 second round of presidential elections. She advocates the idea of a multi-polar world supported by US President-elect Trump, Russian President Vladimir Putin and UK Prime Minister Theresa May. "I feel less isolated today because of the multi-polar world defended by Donald Trump, but also by Theresa May and Vladimir Putin," the FN leader claimed. Currently, most polls predict the repeat of the election story that France first saw in 2002. Back then Marine’s father Jean-Marie Le Pen, who headed the FN till 2011, unexpectedly went into the second round of presidential elections just to be defeated due to voters’ last-minute concerns about the far-right president. Still there are evident differences between the former and current leaders of the French far-right. While the father Le Pen, who in 2015 was expelled from the party he founded after referring to Nazi gas chambers as a "detail of history", was most often labeled by opponents as fascist, Marine has carefully cultivated an image of a defender of the national welfare state, although only for the native French. In December, she reiterated her initiative to end practice of providing free education for children of foreigners living in France. Since assuming leadership of the FN in 2011, Le Pen succeeded in softening party's image and presenting it as a force caring for working class interests, rather than simply anti-migrant and anti-Muslim party. Marine is far more popular among the French that her father was. And even if she secures the support of one in three voters (most polls predict that her main right contender Francois Fillon is to get two thirds in the second round), it will be an astonishing achievement that may inspire far-right movements in other European countries. First of all, Marine's success can be seized upon in Italy and Austria that hold parliamentary elections in 2018 and that have already experienced the unprecedented rise of anti-establishment and far-right forces. Austrian far-right Freedom Party and Italy's Five Star Movement enjoy the novel level of popularity in their respective countries. Freedom Party’s presidential candidate Norbert Hofer gained 46.2 percent of the votes in the December election rerun, a result that was far from negligible for a party hailing from outside the political establishment. The election winner, independent Candidate Alexander Van der Bellen received 53.8 percent of the votes. Italian Five Star Movement is currently holding 91 of 630 seats in the country’s lower parliament chamber and 35 out of 315 seats in the Senate. "What they all have in common is that right-wing, populist and extremist parties try to become socially acceptable. If just one of them wins an election, they will invite that one and he will accept the invitation in order to optimize his international exposure and recognition," Austrian political strategist Josef Kalina told Sputnik ahead of the Austrian presidential rerun on December 4. Germany is due to hold parliamentary elections in the fall next year. The current conservative chancellor Angela Merkel, who has been ruling the country for three terms in a row, announced in late November her intention to join the fight for the fourth one. Germany’s economy, that remains the strongest in the European Union despite the economic crises that hit the bloc while Merkel was in office, goes a long way toward explaining why most voters do not feel tired of their long-standing chancellor. In November, the "Politbarometer" poll, commissioned by the German broadcaster ZDF, found that 64 percent of respondents thought favorably of Merkel decision to run again, and, according to a Emnid survey, also in November, some 55 per cent of Germans wanted her to serve a fourth term. At the same time, Merkel's position on the immigration is not without its detractors, even inside her own coalition. The Bavarian Christian Social Union (CSU), traditionally aligned with Merkel’s Christian Democratic Union, repeatedly asked the chancellor to lower the number of migrants allowed into the country. In November, CSU agreed to continue its partnership with Merkel’s party despite the chancellor’s refusal to introduce the cap on migrants’ numbers. However, following the recent terror attack in Berlin, when a truck ploughed into a Christmas market killing 12 people, CSU leader Horst Seehofer said that in case of the conservatives winning federal election in 2017 his party would only form coalition with Merkel if the chancellor agreed to put an upper limit on immigration. After receiving some 900,000 refugees last year and facing sharp rise in crime, including terror attacks committed by Muslim migrants, Merkel party’s position is not as strong as it used to be. 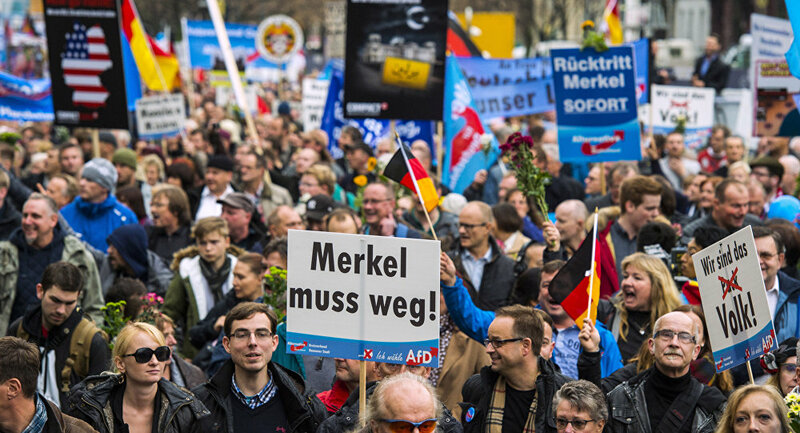 The chancellor's "welcoming culture" toward migrants and Germans' dissatisfaction with it boosts popular support for far-right party "Alternative for Germany" (AfD). A relatively new party, created in early 2013 out of protest against Germany’s handling of the eurozone crisis, in particular the decision to bail out Greece, has since then gradually shifted further to the right and become more focused on lambasting Merkel's migration policies and protesting against the Islamization of Germany. What CDU lost, AfD gained. In May 2013, the party obtained representation in the state parliament of the German land of Hesse. By now, it has seats in 10 out of 16 state parliaments all across the country, including CDU's traditional stronghold in Mecklenburg-West Pomerania and Berlin. Next year, AfD looks forward to transforming its local successes into the federal level victory with the party projected to enter the German Federal Bundestag, where the parliament is seated, as the third largest party. AfD is too young and CDU is too strong for any radical changes to shake up the political landscape in Germany next year. But Germany's far-right is definitely a force to be reckoned with. Their influence has already been evident by how it pulled mainstream parties to more extremes. This fall, Merkel, who has long been regarded as the most migrant-friendly EU politician, first suggested that the repatriation should be considered first when dealing with refugees, and later indicated her support for a ban on full-face veils "wherever legally possible." Apart from draining the migration flow, AfD is promoting traditional family values and emphasizing the importance of the help to the families in need. AfD is also critical of the Germany’s current legislation encouraging the use of renewable energy and rejects government subsidies for energy production. France, Germany and the Netherlands are home to the biggest far-right success stories, and the elections will draw the world’s attention to these countries next year, but Austria’s Freedom party, Hungary’s Jobbik and Sweden Democrats will also continue building up their platforms to chip away at the political establishment.